Last week I was visiting family in Baltimore and was literally ecstatic over a meal of Old Bay steamed hard shell crabs. I sat with my friend Lou at a paper covered picnic table (in a restaurant of course) with two dozen jumbo sized crabs strewn in the middle. I closed my eyes and smiled and just breathed in the steaming hot, spicy, salty smell. It brought back summer memories of backyard feasts in my childhood row house, of outings in Ocean City and of any and all get-togethers with family and friends all times of year. With a wooden mallet, a plastic knife and a bottle of beer by my side, I dug in, enjoying every morsel, slurp and bite. 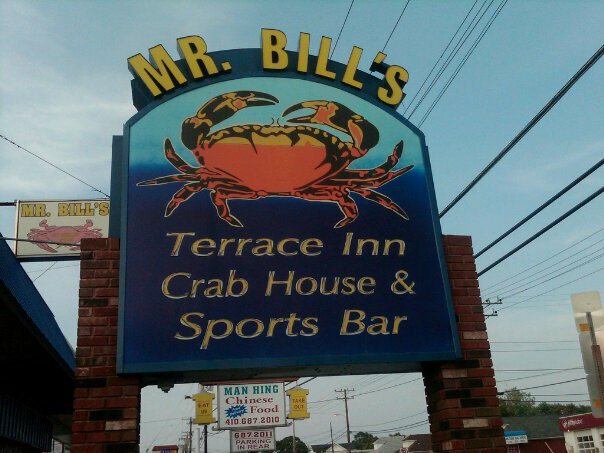 This place, Mr. Bill's on Eastern Avenue, even had a few old Baltimore Colts at the next table. Tom Matte, former running back in the Johny Unitas days, stopped by and said hello. How I remember when the Colts played at the old Memorial Stadium before the Ravens came to town. How authentic were my childhood memories, now retrieved. I was finally sated when my mouth had that numbed feeling brought on by hot spice and salt and I was covered in Old Bay to my elbows. I started this piece thinking about food, then culture, then how culture shapes what one considers food, good food. I mean, what does 'delicious' really mean? When I left Baltimore in the 1970s, I didn't realize what an odd treasure I had consumed all of my life, how steamed hard shell crabs, crab cakes, soft-shell crab sandwiches on white bread with mayo, lettuce and tomatoes, had given me a multi-sensory cultural anchor. As a kid, I spent hours under my father's and my Uncle Tommy's tutelage learning how to peel off a shell, clean out the guts, crack a claw, and finesse a back fin, meat intact. Being neither Irish nor Italian like all my other Catholic friends, I thought I had missed out in the ethnic food department; I now realize regional foods too give one a sense of identity. In my travels (and that's where I am heading here), I've somewhat-savored interesting ethnic and regional specialties in the countries I've visited. Sometimes I enjoyed the most amazing meals (lamb in Jordan, morning glories in Cambodia, everything in France), other times I just watched, or, in the case of the man here eating maggots, I took a picture. I have eaten turtle (the whole little critter with shell), fried cow intestines, goat, roasted whole guinea pig, pig hearts, fried chicken brains, sheep brains, wild ibex, yak butter, buffalo milk, any number of fermented drinks (I don't want to know!) and one quick shot of buffalo bile. While truly I am not a very adventurous eater, I seldom say 'no' when offered food. Of course, in addition to my Baltimore blue crab mania, I grew up loving pig tails in sauerkraut, pickled pigs feet, fried tomatoes and raw oysters and clams (not so unusual?). Here's where I tie all of this into humanitarian aid: food is a cultural construction. We grow up and get enculturated as anthropologists like to say, learning from our friends and family what is appropriate to eat. We eat food in particular contexts, creating memories linked to people, places and holidays, all easily conjured by smell or taste or even texture. Think of grilled hamburgers in summer or a roast turkey on Thanksgiving. When we (in the West) give to those in need we must be culturally sensitive, even when giving food. If soy beans are seen as cattle food not a high protein substitute for meat, think twice before assuming someone will immediately take to your gift . . . especially when replacing a food crop item (like soy beans for corn). Or, if an economic incentive means cutting back on foodstuffs and growing an export crop like coffee or bananas, be sure people can still produce what they need to survive (culturally and nutritionally) should the mono-crop market fail. Many wiser anthropologists, economists and development experts have written on this topic. I am simply bringing the message home. Food is cultural, it is part of our rituals, it is an element of our identities. Don't assume that what makes sense is what should be done. Working with/within a peoples own cultural norms always gives the best results. After all, while food is cultural, hunger and scarcity are often economic and political, even when exacerbated by war and drought. For more on food and nutrition, see Children's health: good business, better nutrition. That said, if you are ever in Baltimore . . . dive into the local culture and visit Mr. Bill's! Or, if you are in Nigeria, check out the local markets (below). You cannot get fish much fresher than this in the market!